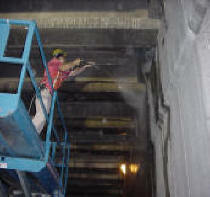 Control and removal of pigeon nests and feces, Pressure washing freeway under passes and netting off the tops and sides of the underpasses to prevent pigeons from living in this area and making a mess on the cars and walkway below. 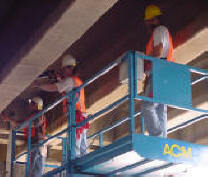 This project was for pigeon proofing using netting to 6 freeway under passes in Phoenix, Arizona that took 3 months of working at nigh with 7 men. After removing all the hundreds of pounds of pigeon feces and other debris by hand we had to pressure wash the exhaust dust and remove the remaining feces so the underpasses could be painted below our net. Installing the 25,000 ft of cable systems 9,000 split pins and 90,000 sq. ft. of black 2" netting at night using flood lights is harder than it looks with all the shadows and odd angles the light created. 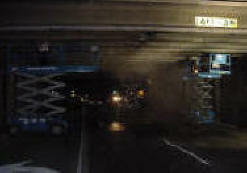 Project took 3 months using 7 men working from 9:00 pm - 6:00 am, 5 nights a week plus working around other trades on the job. 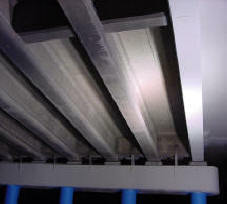 Netting installed along the underside of the underpasses and along the sides to prevent pigeons from nesting looks clean and most drives don't even know it's there. The netting that we installed has held up well over the years, only problems is when landscape trucks go under the bridges, PVC pipes or junk sticking up has cut the net. Our work has held up well and patches are easy to make. You can see all the pigeons that we flushed out waiting on the nearby billboards to get back to their nest sites under the bridge after we finished. 5 years later the net is still working and the bridges are still pigeon free. 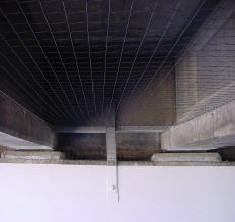 On the face of the under passes we had to install netting that would look good and still keep out the pigeons. Looking from inside the netting you can see all the great places that the pigeons could nest and roost. 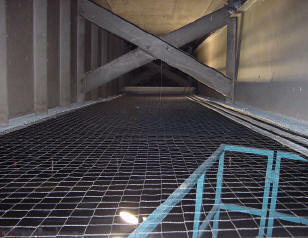 Netting is installed from beam to beam so that passing cars and trucks don't hit the netting and tear it out. 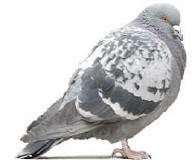 We have had some trucks come by with Pvc pipes and back hoes sticking up that tore holes and took out some of the concrete and steel beams, but no pigeons are back.